Here’s a list of impressive Drupal sites which I’ve found on the net. There are a few existing lists out there, some of which are at the bottom of this post, but I’m curating my own based on my own taste. If you know of any sites I’ve missed out that should be here, please write a comment below. Speaker: Peter Brownell, Co-Founder of School Of Everything, a Drupal based start-up in London. 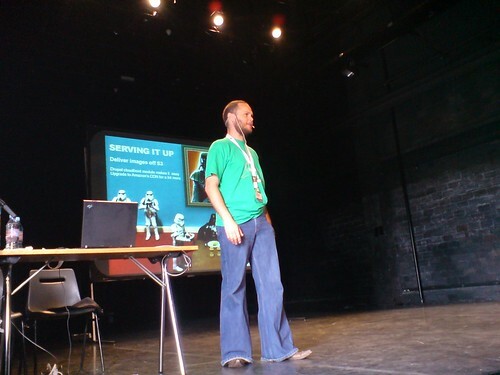 He is also a Director of Code Positive, and has been involved in the London Drupal Community for many years. MySQL proxy changes the game. If your machine cannot be reconfigured, it can’t be in a cloud. You need to know how your machine was set up. Do things well. Assume that any part of the cloud can die. How do we go about reconfiguring that? Be able to rebuild from backups. Fire drill – practice makes perfect. Rebuild debian host. Rebuild Drupal site. Drupal’s easy to rebuild. In emergencies, put in on a single server and temporarily disable some admin stuff that you don’t need; and then put it in front of a proxy. Never have faith in just one ally. Set up a base off the cloud. Keep a backup on the ground. Monitor from the outside. Mail smarthost to avoid auto greylisting. Monitor as much as possible. Don’t trust anything. Look for clues for where problems arise. Do capacity planning. “We used Nagios and Munin”. The physical world moves a little slower. Virtual machines are cheap but you need to plan. Configure one original and make many copies, in multiple zones. Only pay for the time you use. It’s not two of everything always, it’s a spare when you need it. How safe is your data on the storage? “For the first month, we ran our MySQL database on EC2. Write to S3, read from local DB. Elastic Block Store – EBS. Deliver images off S3. Drupal cloudfront modules makes it easy. Upgrade to Amazon’s CDN for a bit more. Round Robin DNS is a cheap solution for load balancing. Cloud forces best practice. No time for slacker sysadmins! I’m right now at the last keynote of DrupalCon Paris 2009 – Semantic Web Fundamentals by Dan Brickley who is quite active in the W3C community. Layers of data – What links the layers? Linking – Working on ways to identify when two documents mention the same thing and how to tie them tgether. W3C POWDR – label pages or collections? All LCSH topics on Paris – why can’t they be associated? Drupal Fields API – attach arbitrary properties to anything in Drupal 7. RDF does the same for the Web at large. It’s natural to bridge the two. Drupal & Data APIs – SPARQL is to RDF as SQL is to RDBMs. SPARQL scripting looks very familiar to anyone working with SQL. There’s a growing ecosystem around linked RDF data including people. Amnesty International’s dev team is getting involved. There’s a potential for manipulation when people put their info into RDF. What kind of manipulations are already appearing? We have to expect lies because the Web is full of it, like with HTML. Build as many links to real data as possible. Based on those links, we can filter away fake data. How do we manage links between the computer and the real world; and the data on our website? It’s natural for people to make different decisions at this point based on their needs. For example, my info is scattered on different websites e.g. blogs, Flickr. If you have a clear linking model, it doesn’t matter much. Is there an initiative to collect taxonomies in specific industries e.g. leisure and engineering. Basically a way to register your taxonomy so others can use it? Good question. We don’t have a nice directory but with things like SearchMonkey, people can choose to see what’s out there to use. That’s something that we’re working on at W3C – some way that’s easy to maintain. With regards to privacy, is there a way to index my text but not let everyone to view them? A friend of mine asked me how to download videos from YouTube so I might as well write it and send her the link. After all, I couldn’t find a guide that could easily explain the steps in a simple manner. There are a few websites that will let you download YouTube videos. One of them is KeepVid. In KeepVid, paste in the link of the YouTube video. Click Download and save the mp4 version. You should be able to play mp4 files in Windows Media Player. If not, download and install VLC Media Player which is a free and popular program for playing DVDs and video files. Phishing emails are bloody annoying — they’re the type that imitate authentic emails from banks and try to convince you to put in your email and password into a fake page. The best way to avoid falling for scams like these is to look at the URL and check that it’s your bank’s real website. Create a group in your address book with these 3 emails so it’s easier — you can then just forward phishing emails to that contact group. I just forwarded a site that wasn’t blocked by Firefox to the above emails today; and it was blocked 15 minutes later. Was it because of my reports? No way to tell, but it doesn’t hurt to help make the Web a safer and more fun place especially if it only takes a few seconds of your time. It’s been a while since I wrote about anything on this blog, mostly because of Twitter, so I thought I’d start using my blog more to share articles with the world. Every release of FFmpeg is a step closer towards creating alternative video networks to YouTube and having people avoid putting all of their eggs in one basket. So it’s good news then that FFmpeg 0.5 has just been released. Major changes include more support for Real, AAC and WMV9. Centralization of video sharing over the Web faces problems when countries only have to block a few video sharing sites to prevent access to human rights related videos, YouTube being the most popular, of course. In fact, YouTube themselves have been involved in the censorship of politically critical videos.